For my birthday on 14 September 2012, I got a lovely retro radio / cassette player!! It is a Classic Cicena Overdrive boombox, from 1991. The design is often compared to either ’55/’57 Chevy or ’58 Corvette car dashes. Most call it a ’57 clone. This unit also has all the boombox features for AM/FM radio along with a cassette player. It is powered by an AC cord or 8 “D” batteries. I just love its stylish white front and its red top, its steering wheel shaped handle, and especially its “dashboard” which lights up the station/channel numbers in orange for FM and in red for AM. The lights look lovely in the dark. The red and white version is apparently the original, but there are some colour variations, such as green and white, as shown at Paul and Brenda’s site, including an authentic Coca Cola branded version. The authentic Coca Cola version has the “Coca Cola” logo on both ends of the radio, and mine is not such a radio, because it has “Taste it All” and “Enjoy Diet Coca Cola” on it !! Also, the model number on mine is 261, but the Coca Cola branded one has a different identity plate, as shown on Paul and Brenda’s site. I think that the authentic Coca Cola branded Cicena Overdrive Boombox would be pretty valuable. 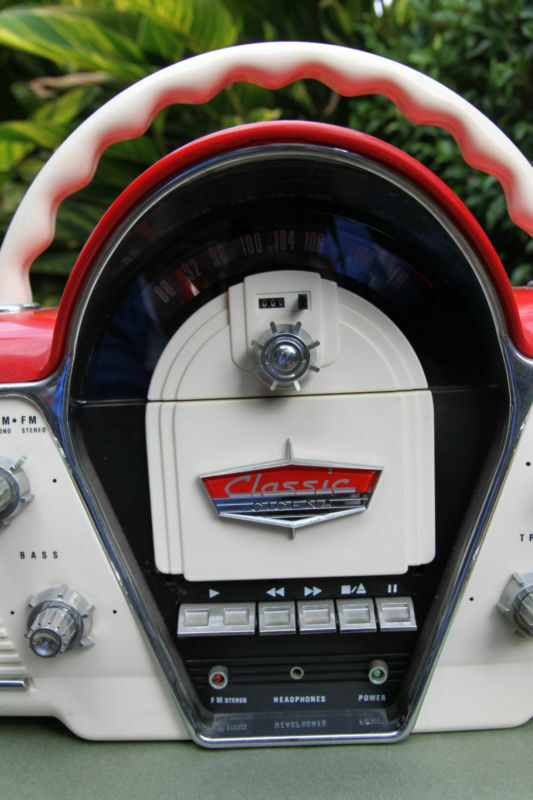 The radio has excellent sound quality for both AM and FM and controls for Bass and Treble also. I do still have a few cassette tapes, but can’t see myself using the cassette player much, but it is good that it has it! Be careful if purchasing this radio from eBay as you need to check the voltage required on the identity plate of the radio, to make sure your radio will work in your country, using electricity. For example, Australia has voltages of 240 while in the U.S.A. the electricity voltage is lower. You should be able to use batteries to run the radio. 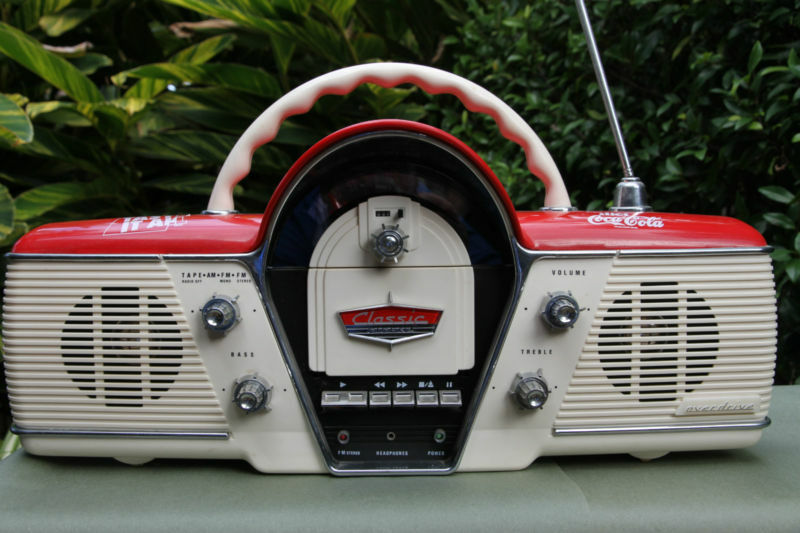 UPDATE: If you are looking for a red & white Cicena radio in Australia (or else-where), please be advised that some people that I know bought mine for me online. You can search the Worthpoint and eBay online auctions for a radio that works in your country, or try the Classified newspaper section, like “Gumtree”. Categories: Art, Entertainment, Music | Tags: boombox, cicena overdrive, radio, radios, retro | Permalink. woohoo, thank you Colin. You made my day. I should let Brenda know there are TWO Coca Cola Cicena Overdrive Radios, and I have proudly got one of the types !! I am so glad to hear that. These days one can’t always / easily tell if things are “doctored” or repro, and as I couldn’t see the Diet Coca Cola logo radio on Paul & Brenda’s site, I thought mine wasn’t a radio with authentic and original logos. Paul & Brenda say the 261 radios are not Coca Cola branded, so is yours a 261, Colin ?? My partner says the logos on my radio are painted on, and are not Decals. Now, I just wonder how valuable our radios are at this present time …..